Last weekend I attended the National Young Leadership Cabinet Civil Rights Mission to Alabama. 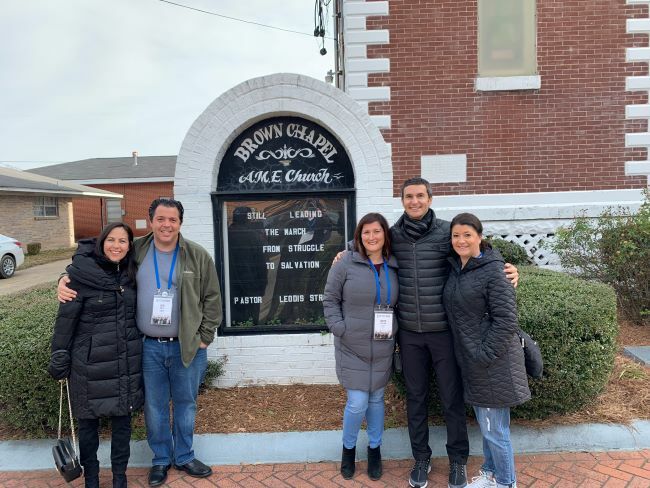 Five of us from San Diego – including Debbie and Jack Maizel, Simone Abelsohn, and Kira Finkenberg – joined this informative tour of the seminal sites of the civil rights movement. We attended Shabbat services and engaged with the local Jewish community in Birmingham. We visited the Rosa Parks museum in Montgomery. And in Selma, we walked across the Edmund Pettis bridge, site of the famous protest marches led by Martin Luther King Jr. and supported by Rabbi Abraham Joshua Heschel that led to the end of racial discrimination in voting. I was particularly inspired by two things. First, the role Jewish leaders played in the civil rights movement. Civil rights are a profoundly Jewish concept. The view that we are created in G-d’s image, and thus every life has value and should be treated accordingly by one another and by the law, is foundational to Judaism. I am proud to be a Jew when I see the role our leaders played in that noble endeavor. The second source of inspiration was Martin Luther King Jr. Specifically, I am inspired by the strategy he employed to win the civil rights struggle. The genius behind King’s success was his strategy of non-violence. Non-violence is not a one-size-fits-all. As Jews, we know all too well that non-violence is not always an option. Last century violence was necessary to defeat Nazi Germany and save the Jewish people (barely). And today, sadly, force is necessary for Israel to defend itself, as it has been since its rebirth in 1948. King could have deployed violence. After all, he was on the “right side of history” and justice was on his side. But for King, non-violence was not only a moral play, it was also a winning strategy. King knew that if the civil rights activist responded with violence to the vicious and inhumane attacks that were inflicted upon them by the heavy-handed and morally flawed authorities, the civil rights movement would have been seen as a group of unruly, uncivilized troublemakers. Even though he had the right to do so, going eye-for-eye and tooth-for-tooth would have compromised the mission. Instead of violence, King invoked the themes of love and justice. He did not antagonize his opponents. He did not vilify his enemies – no matter how much they deserved it. He did not castigate America for its flaws. He challenged America to live up to its lofty ideals. America accepted the challenge. King won. And America won too. We all won. Today our political rhetoric is divisive. We not only disagree with our ideological rivals, we think they are wrong or dangerous or racist or naïve. We should learn from King. We should not antagonize our neighbors. We should not vilify those with differing political opinions. We all want the same things: a vibrant Jewish community, a prosperous America, and a safe Israel. We may disagree about how to get there. And that's OK.
David Bramzon is Jewish Federation Board Chair-Elect. He will succeed Brian Tauber in July. David is a member of National Young Leadership Cabinet, the premier leadership development program of the Jewish Federations of North America. Cabinet has about 250 current members nationwide, including 10 from San Diego.